Heat the oven to 180 C / 350F. Grease and line an 8″ round cake tin with greaseproof paper. Beat in the eggs, one at a time and vanilla essence. Sift in flour and baking powder. Fold using a spatula or beat on a very low speed until just mixed. 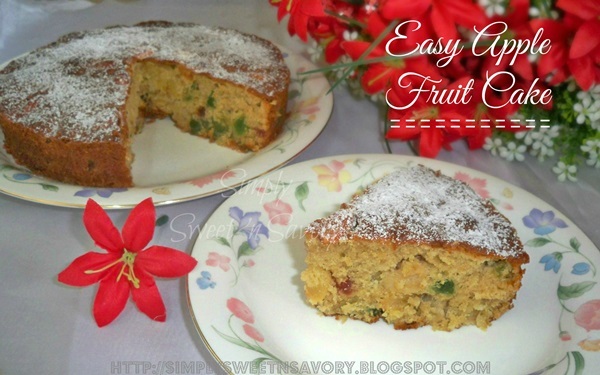 Stir in apple, candied fruits and raisins. Spoon the batter in the cake tin and gently spread out with a spatula. Bake for 45 to 50 minutes until the cake is dark golden and a skewer inserted into the center comes out clean. Stand in the tin for 5 minutes before turning out onto a wire rack to cool completely. Cool completely before decorating or simply dust with icing sugar, before serving. Hope you try out the recipe and enjoy it. 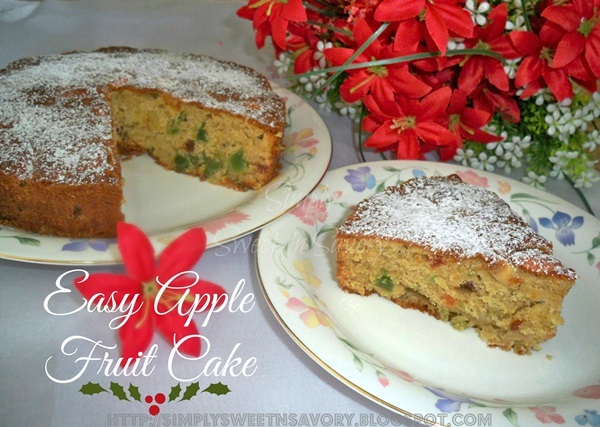 I’d love for you to visit me at my blog Simply Sweet ‘n Savory where you’ll find more Christmas treats. You can also find me on G+ and Pinterest. Happy Holidays!!! I’d like to thank Ambreen for being here today. Please be sure to follow her over at Simply Sweet ‘n Savory! 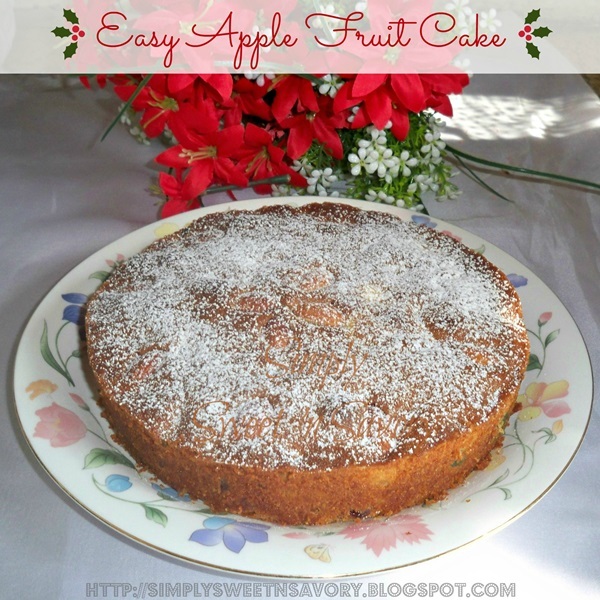 I drop here to see Ambreen’s recipe, cake is real yum, like your guest post. Have a nice day to both of you! Ambreen – it’s a beautiful cake! This is just adorable, mind blowing tasty and delicious All I can say this for it. My dad loves fruit cake. I might have to try this for him!